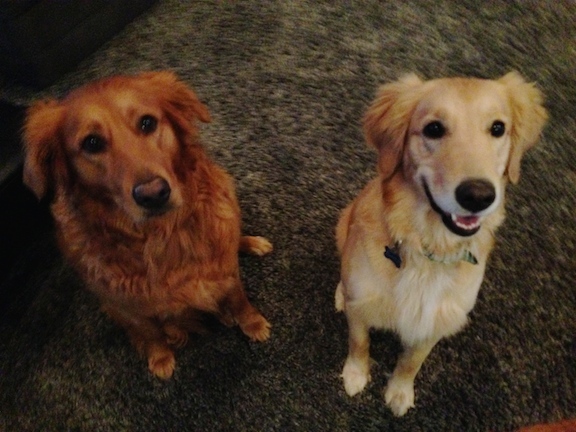 Blaize is a three-year-old Golden Retriever / Greyhound mix, pictured here on the right with her room mate Bezzy. I was called in for help after Blaize attacked one of her owners when she attempted to stop the dog from eating a few pieces of chocolate that had dropped on the floor. According to her owner, its wasn’t just a snip either. The dog bit her owner several times and it wasn’t until Bezzy, the long-time family dog stepped in, going after Blaize until she stopped the attack on her owner. As a new member of a pack, some behavioral issues are to be expected, but aggression that results in an attack is obviously unacceptable. Her owners told me that if I wasn’t able to correct her food aggression, they would not be able to keep the dog. I have a tremendous amount of respect for their willingness to work with a dog who had bitten a member of the family. So far I have helped rehabilitate six dogs that were on their last chance. I was determined to make sure that I was able to put a stop to Blaize’s aggression so she could be my number seven. When I arrived for the session I keep a keen eye on Blaize looking for any signs of discomfort, dominance, aggression or any other behavioral issue. I discussed the issue with her owners and learned that when they rescued Blaize from the shelter, they were told she had some food aggression issues. As we were discussing the situation, Blaize’s energy level started to creep up and the owner who was bit alerted me that this was similar to the scenario that resulted in the bite. I immediately put Blaize on a leash and corrected her while also putting her into the sit position. Whenever a dog starts to engage in any unwanted behavior, its much easier to disagree with if you address it as soon as it begins. The sit position is more subordinate so its a good place to start, but if a dog gets excited, it usually doesn’t sit in place to do so. Once Blaize was on the leash, I dropped it to the floor and stepped on it about a foot from the dog’s head. Blaize attempted to pull free, but by stepping on the leash this way, I negated her ability to wiggle free. After a moment Blaize sat, then laid down on the floor. A minute later, her energy level dropped back down so I stepped off the leash slowly. Blaize continued to lay there quietly on her own. Her owner (the one who was bitten) told me she was impressed at how quickly this changed the dog’s energy level. While the technique is effective, the most important thing was initiating it as soon as the dog started to get excited. I suggested that the family repeat this process any time the dog starts to get excited. By repeatedly interrupting the excitement when it starts, the family will be able to help Blaize learn that over excited behavior means a reduction in freedom to move. Once Blaize got up, she walked over to one of her owners and sat practically on top of them. They said the dog did this frequently as well as rubbing herself against the members of the family, or pawing at them once she got close. While many humans interpret this closeness and rubbing as being cozy, in reality Blaize was attempting to scent mark each family member and claim any space near them as her own. These are dominance behaviors and so I suggested that her owners not allow them any more.I showed them techniques to stop Blaize from them and also suggested that they adopt a “No Free Lunch” methodology; no petting, attention or rewards for Blaize unless she does something to earn them. By making the dog come to us, sit or lay down before we provide a pet, scratch or attention we can help further define the leader follower dynamic. Next we went over a simple recall exercise so I could see how the dog interacted with and followed the lead of its owners. Blaize started off slowly, but started to move with more confidence after we repeated the exercise a few times. We took our time and made the dog sit in front of the person who called her before offering any reward or praise. I suggested that they practice this exercise a few times a day for the next week or two. This positive reinforcement will help condition the dog to respond to her owners and also see them as authority figures. Next I introduced a leadership exercise to help eliminate Blaize’s instinct to be possessively dominant around food. I placed a high value treat on the ground, then stood over it to claim it as a dog would. When Blaize moved towards the treat, I immediately moved towards her in a very deliberate way. As soon as I moved forward, Blaize stopped, then backtracked away from the treat. Once she did, I took a step back and waited. When Blaize stood still, I took another step back and paused again. I repeated this until I was standing about 12 feet away from Blaize with the treat on the floor between us. After a few moments Blaize sat, then laid down. As soon as she did, I took a few steps forward, turned to the side then kneeled down and tapped the floor behind the treat to communicate that she could have it. As soon as I did, she immediately cam ever and claimed the treat reward. I repeated this several times until I was sure that Blaize wasn’t attempting to be food territorial and that the understood that laying down to surrender any claim of the treat resulted in her being rewarded with the treat. Once I was sure she understood the rules, I coached all the members of the family through the exercise as well. It will be important for her owners to master this exercise and keep a keen eye on Blaize as they practice. To ensure that Blaize does not get food aggressive in the future, I went over a more structured ways of feeding the dogs. By eating before feeding them, and feeding them one at a time, we can help remove any excitement from the activity. I also suggested that they feed Blaize last and feed her by hand. When I suggested this to the owner the dog had repeatedly bitten, she had a brief look of apprehension, but powered through the exercise perfectly. When we finished feeding the dogs, their owners told me repeatedly how surprised at how Blaize behaved throughout the session. By taking our time and keeping Blaize from getting excited, we were able to avoid all of the aggressive, territorial and possessive behaviors. This is key anytime you are dealing with a dog who has shown aggression or drawn blood. Fortunately, Blaize is not an aggressive dog. Her problem was getting over excited and the perception that she was in a leadership position whenever food was nearby. By practicing these exercises and correcting her at the first sign of excitement in these situations, Blaize will soon no longer feel a need to defend her food and will learn its good to defer to the humans in her home. Because rehoming was a very real option, I was very pleased with how well the session went. Based on the participation of the members of the family, Im confident that Blaize’s days of aggression are a thing of the past.